This English translation from the Dutch volume is a study of a quotation by St. Augustine as it was understood in the late medieval period. De Kroon focuses on how this quotation was interpreted by two theologians: Wessel Gansforth (d.1489), the Northern humanist and theologian connected to the devotio moderna and the Brethren of the Common Life, and Martin Bucer (d.1551), the Protestant reformer who further developed Gansforth's ideas. This study is accompanied by a series of shorter texts, all showing the reception of Augustine's phrase in late medieval theology, and contrasting it with Gansforth's understanding of it, which Bucer was to adopt. 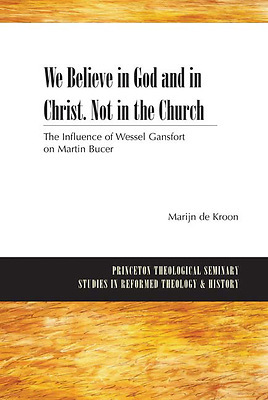 With his commented edition of source-texts, de Kroon throws a new light on the links between late medieval Reformation thought, demonstrating how a fully-fledged reformer like Bucer used the works of medieval theologians. In fact, this is the first work to point to a concrete case of Gansforth's influence on the Reformation.